It’s not a shock that Anna Wintour, editor-in-chief of American Vogue magazine, is a fashion icon and an inspiration to hundreds of high- end fashion designers. She predicts trends and says what’s “in” and what’s “out”. Fur was never in fashion magazines until Wintour put it on the cover. Ever since then, designers started using fur and fur was seen as a luxury item; an item that everyone who was anybody just HAD to have. Wintour believes that fur is a such a vital part of fashion and is a symbol of luxury and wealth. For those people of that status, they should be able to wear what they want to represent in the most expensive way. But…is the price of a luxury fur coat really worth the suffering of millions of helpless animals? Perhaps Wintour is either blinded or dumb to the fact that all of this is going on. The truth? Faux fur looks the same, feels the same, is inexpensive, and gives animals the chance to live. In “60 minutes of outtakes: Anna Wintour on Fur”, Wintour defends the fur trade, saying that if fur is a part of fashion, a Vogue is a fashion magazine, she’ll continue to keep putting it on the cover. 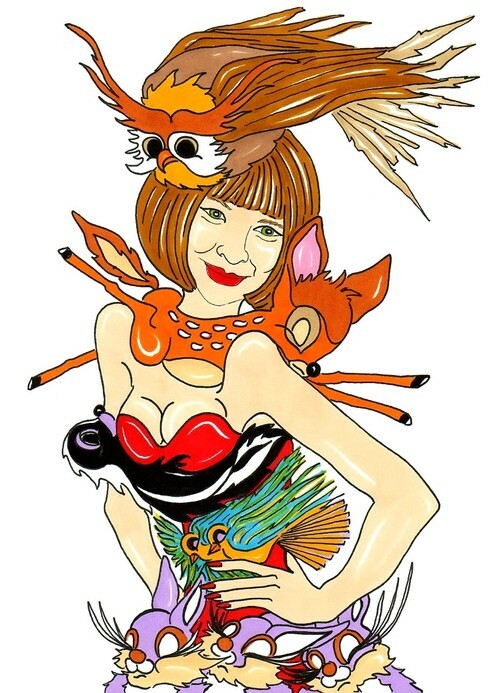 This picture is an exaggeration of Wintour’s outfits, but as cartoon-ish as it may be, it holds a lot of truth about the number of different animals used and the way in which it is worn.